I have this in Cherry. It smells like cherry Chapstick and tints my lips about the same amount--which is to say it hardly shows up, even when you layer it on. I guess "NATURAL" would be a nice way to describe the effect. It does moisturize decently, and keeps my lips feeling comfortable for awhile, but it's nothing particularly amazing. The formula feels slightly nicer than Chapstick, but it's not...read more significantly different enough to warrant the ridiculous seven dollar price tag. 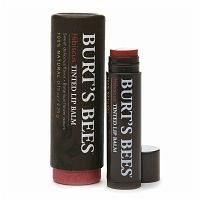 There are so many alternatives--if you MUST have a tinted balm from Burt's Bees, get one of their tinted shimmer shades. Or buy another brand (Alba Botanicals makes great tinted balms that even have SPF and are much cheaper). And for a company that seems to be "green" and "natural" I'm really surprised by the excess packaging that Burt's Bees used on this product. As a mom with an odd, super pale, with warm undertones complexion: I find lipstick looks insane on me. But these are so nice!! On first swipe they don't deposit much colour, you might as well be putting chapstick on (which is great when I'm in a pinch for some) but you can layer the colour and it doesn't get clumpy or messy. I love the light natural tint I get, and the fact that they moisturize like a balm.